Find out about the positive and negative effects of wine on your health based on the current scientific evidence. The whole issue of whether drinking a glass or two of wine a day is good or bad for you has raged in the health community for years. One study seems to say one thing, then another comes out and is contradictory. Some researchers have dismissed some studies because drink companies have fully or partially funded them, though in many cases there observations are perfectly valid. In the face of this ambiguity, some health bodies have advocated strict and low limits on weekly drinking e.g. UK 14 units per week in both men and women. For years, moderate drinking was linked to many health benefits, including a lowered risk of developing heart disease and longer life expectancy. But more recently, these assumptions were been called into question by a 2016 meta-analysis of 87 long-term studies which concluded that many of these health benefits could be explained by apparent flaws in study design. Some studies compared moderate drinkers to current abstainers, this "sick quitter" group included former heavy drinkers and those who were tee-totallers because of health conditions. After correcting for these factors, the study’s authors found no evidence that moderate drinking had protective health benefits in most groups. However, the study was criticised because the number of studies with design flaws was relatively low and trying to extrapolotate data from this relatively low number of sick quitters was like trying to slice a tiny piece of salami with a blunt knife. So it was concluded in the health community that more analysis is needed on the long term effects of alcohol consumption and health and in the meantime they advocated caution especially as alcohol is linked with raising the risk of some cancers e.g. breast (relative risk higher by 8%, but moderate exercise reduces relative risk by 15%). Doesn't sound like too much fun. In mid-August 2017, a new and large study was published in the Journal of the American College of Cardiology, "Relationship of Alcohol Consumption to All-Cause, Cardiovascular, and Cancer-Related Mortality in U.S. Adults" by Bo Xi, Sreenivas P. et al. The authors concluded "Light and moderate alcohol intake might have a protective effect on all-cause and CVD-specific mortality in U.S. adults. Heavy or binge drinking was associated with increased risk of all-cause and cancer-specific mortality." Relationship of Alcohol Consumption to All-Cause, Cardiovascular, and Cancer-Related Mortalityin U.S. Adults. Am Coll Cardiol. 2017 Aug 22;70(8):913-922. doi: 10.1016/j.jacc.2017.06.054. Previous studies have revealed inconsistent findings regarding the association of light to moderate alcohol consumption with cardiovascular disease (CVD) and cancer mortality. The aim of this study was to examine the association between alcohol consumption and risk of mortality from all causes, cancer, and CVD in U.S. adults. Data were obtained by linking 13 waves of the National Health Interview Surveys (1997 to 2009) to the National Death Index records through December 31, 2011. A total of 333,247 participants ≥18 years of age were included. Self-reported alcohol consumptionpatterns were categorized into 6 groups: lifetime abstainers; lifetime infrequent drinkers; former drinkers; and current light, moderate, or heavy drinkers. Secondary exposure included participants' binge-drinking status. The main outcome was all-cause, cancer, or CVD mortality. After a median follow-up of 8.2 years (2.7 million person-years), 34,754 participants died of all causes (including 8,947 CVD deaths and 8,427 cancer deaths). Compared with lifetime abstainers, those who were light or moderate alcohol consumers were at a reduced risk of mortality for all causes (light-hazard ratio [HR]: 0.79; 95% confidence interval [CI]: 0.76 to 0.82; moderate-HR: 0.78; 95% CI: 0.74 to 0.82) and CVD (light-HR: 0.74; 95% CI: 0.69 to 0.80; moderate-HR: 0.71; 95% CI: 0.64 to 0.78), respectively. In contrast, there was a significantly increased risk of mortality for all causes (HR: 1.11; 95% CI: 1.04 to 1.19) and cancer (HR: 1.27; 95% CI: 1.13 to 1.42) in adultswith heavy alcohol consumption. Binge drinking ≥1 d/week was also associated with an increased risk of mortality for all causes (HR: 1.13; 95% CI: 1.04 to 1.23) and cancer (HR: 1.22; 95% CI: 1.05 to 1.41). 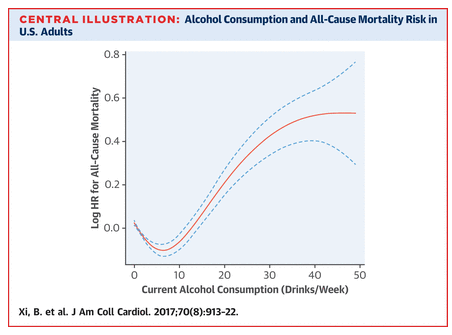 Light and moderate alcohol intake might have a protective effect on all-cause and CVD-specific mortality in U.S. adults. Heavy or binge drinking was associated with increased risk of all-cause and cancer-specific mortality. Men and women who engage in light-to-moderate alcohol consumption have a decreased risk of mortality from all-causes and cardiovascular disease, according to a study published August 14 in the Journal of the American College of Cardiology. Bo Xi, MD, et al., looked at the relationship between all-cause, cardiovascular disease and cancer mortality risks and current alcohol consumption patterns. The researchers used data from 333,247 participants obtained through the National Health Interview Surveys from 1997 to 2009. Alcohol consumption patterns were divided into six categories: lifetime abstainers, lifetime infrequent drinkers, former drinkers, and current light (less than three drinks per week), moderate (more than three drinks per week to less than 14 drinks per week for men or less than seven drinks per week for women) or heavy drinkers (more than 14 drinks per week for men or seven drinks per week for women). Throughout the length of the study, 34,754 participants died from all-causes. Of these, 8,947 deaths were cardiovascular disease-specific (6,944 heart disease-related and 2,003 cerebrovascular-related deaths) and 8,427 mortalities were cancer-specific. The results of the study showed that men who are heavy drinkers have a 25 percent increased risk of mortality due to all-causes and a 67 percent increase in mortality from cancer; however, these results were not significant in women. Men and women who engaged in moderate drinking had a 13 percent and 25 percent decreased risk of all-cause mortality, and 21 and 34 percent decreased risk of cardiovascular disease mortality, respectively. There were similar findings for light drinking for both men and women. Light-to-moderate drinking may have protective factors for either all-cause or cardiovascular disease mortality, write the authors. To decrease all-cause, cardiovascular disease and cancer mortality risks, the researchers emphasize that a balance needs to be considered when looking at individual patient recommendations, however reducing high alcohol consumption is necessary. In an accompanying editorial, Giovanni de Gaetano, MD, PhD, said that while younger adults should not expect considerable benefit from moderate drinking, "for most older persons, the overall benefits of light drinking, especially the reduced cardiovascular disease risk, clearly outweigh possible cancer risk." 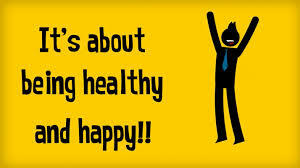 He concluded by noting that those who do not drink should not start, but rather focus on adopting a healthy lifestyle surrounding "regular physical activity, no smoking, weight control and dietary habits." % alcohol in the drink and volume drunk. The amount of water in the body. The person with more water in their body gets less drunk since it dilutes the effects of the alcohol. It is dependent on your body volume and the proportion of fat to muscle. There is much more water in muscle than fat, so the more muscle you have the better. A typical adult has 30 litres - 70 litres of water in their body, so someone only having 30 litres will feel the effects of alcohol quickly, whereas someone with the higher levels of water will need significantly more to feel the same effects. Don't get dehydrated on a night out, drink plenty of water with your wine or beer. As well as meaning you feel less drunk, you'll probably have less of a hangover if you over indulge! Genetic factors. The main method that the body metabolises or breaks down alcohol is dependent on two enzymes: Alcohol dehydrogenase which first converts alcohol into acetaldehyde and Acetaldehyde dehydrogenase (ALDH2) which breaks down acetaldehyde into harmless by-products.Due to genetic differences, 80 per cent of Asians have an overactive alcohol dehydrogenase. This means they break down alcohol into acetaldehyde up to 100 times faster than other races such as caucasians. Since alcohol is broken down faster they can have little to no alcohol effect However,most Asians have an inactive variant of the liver enzyme ALDH2 that means that acetaldehyde takes a much longer to clear from their blood and this causes a phenomenon called "Asian Flush" which causes reddening of the face, sweating and palpitations. Males have more of these enzymes than females,particularly in the stomach. So men can break down alcohol faster than women. Food in the stomach. Eating before or during drinking slows down the passage of alcohol into the small intestine. If alcohol is kept longer in the stomach, enzymes have more of a chance to break it down and less is absorbed and more slowly if it is delayed from going into the small intestine where it passes into the blood stream more quickly. A fatty meal is particularly good before you out or eat cured meats and cheese Italian/Spanish style whilst you have that glass of wine. Remember it takes around one hour in males and females for the body to clear one unit of alcohol. Drinking coffee or getting fresh air doesn't make any difference how quickly the alcohol is broken down in the body. See the FermentedGrape.com video on the health benefits of wine and the French Paradox. A year ago or so I was watching a fascinating documentary on the BBC by David Eagleman, "The Brain", and subsequently read his excellent books. It amazing that we take our brain for granted but experience from those experiencing a starvation of input and sensory information e.g. "the Hole" dark punishment cells in prisons such as Alcatraz and lack of developmental input e.g. kids in Romanian orphanages shows what can happen. When we are born we have roughly the same number of brain cells as in later life but it is the way these cells are wired together is the key. The importance of nurturing the brain during childhood and teenage years helps the brain sort out what is important and what isn't. Mental gymnastics, a rewarding job and rich social life all seem to delay or prevent dementia. Importantly we can adapt our brains because of something called "plasticity" through what we do and for example specialists like a London Taxi driver, a concert piannist or even a wine expert all have important structural changes in their brains because of what they do, learn and practice. Eagleman uses the analogy of the toolbox when overcoming deterioration in the brain and discusses a phenomenon to prevent dementia/Alzheimers called "celebral reserve". He says even if the wrench is broken, we can use a different spanner in the box to do the same task. So elderly sisters in a convent in the United States had physical signs of Alzheimer's disease in the brain when they died e.g. protein anomalies but exhibited no obvious symptoms since they led an active mental life and their brains were able to adapt and "use a different spanner". Eagleman discusses the basis of reality and the fact that we see, feel, hear, smell is the brain's perception of reality called the "internal model". This brain simulation is like the movie the Matrix as it evokes its perception of the outside world. The big lesson is that the more you put into your brain, just like training your muscles in a gym, the better the condition and resilience of your brain. More on brain or "cerebral reserve"
The concept of brain or cebrealreserve refers to the ability to tolerate the age-related changes and the disease related changes in the brain without developing clear clinical symptoms or signs of dementia. A considerable amount of biological research has documented that a number of factors including education, work complexity, social network, and leisure activities may contribute to this reserve allowing cognitive brain function to be maintained in old age. Epidemiological studies have suggest that intellectual challenges experienced across the whole life span may increase the brain reserve and be crucial for preventing the occurrence of dementia symptoms in late life. The factors that can help boost your brain or cerebral reserve are high education, adult-life occupational work complexity, as well as a mentally and socially integrated lifestyle in late life. All these factors could postpone the onset of clinical dementia and Alzheimers Disease. The relevance of physical activity itself remains in debate, as most physical activities include also social and mental stimulation. Leisure activities with all three components--physical, mental and social--seem to have the most beneficial effect. Similarly, there have been studies looking at distinct functional activation patterns in experts. For example, musicians show a distinct pattern of prefrontal activity compared with non-musicians when listening to different rhythms and sommeliers, or wine experts, showed enhanced regions of the memory network when tasting wines. Sommeliers’ brains are of particular interest since their expertise is focused on the smell (olfaction ) and taste (gustation), and associated with multiple other functions including memory, judgement, and the amalgamation of this with other senses. The olfactory regions of the brain are relevant to diseases such as Alzheimer’s and Parkinson’s, where initial degeneration of the brain cells called neurones are isolated to regions important in smell. Furthermore, given that sommeliers are experts not just in a single domain but combine these in an integrating sensory information system. In 2016, researchers from the University of Las Vegas in Nevada conducted MRI scans on Masters of Wine to access structural changes in their brain. What does the Sommelier brain study show? This study identified enhanced structural and functional patterns in the smell or olfactory network of sommeliers. These findings are consistent with the learning they undergo in achieving the status of Master Sommelier. Furthermore, the volume of a region of the brain involved in olfactory memory was associated with experience, suggesting that the continued training results in morphological changes of the brain. These results speak to the plasticity of the adult brain in response to sensory expertise. Future research into therapeutic sensory-cognitive training in individuals at risk from neurodegenerative diseases, such as Alzheimer’s or Parkinson’s, which impact the same regions of the limbic system and entorhinal cortex, might provide an important clinical application of these results. The dorsal subregion of the insula was found to be larger in volume in sommeliers. This is thought to be due to the importance of this region in combining multisensory and higher order cognitive processes, activities that sommeliers practice throughout their training and work. Multiple regions showed an interaction between group and task, that appeared to be driven by more activity in sommeliers than controls, specifically during the olfactory judgment task. We assume that the enhanced, more widespread, activation in sommeliers implies more complex processing of the same information. Overall, there was somewhat more activation in the right hemisphere of sommeliers compared with controls. This is consistent with earlier studies that suggest right hemispheric dominance for olfaction and olfactory memory (Jones-Gotman and Zatorre, 1993). There was no relationship between enhanced functional activation and years of experience. The regions that were different were more specifically related to olfactory memory and cross modal integration, and it might be that these are the particular strengths that are enhanced in sommeliers. After Institutional Review Board (IRB) approval from the University of Nevada Las Vegas (UNLV), a preliminary selection of possible stimuli was conducted with UNLV students. Twelve male participants between the ages of 21–33 were recruited to participate. Following informed consent, participants were given the wine knowledge test. For this pilot study, only participants scoring below 70% were included. Eight non-wine blends were made by mixing varying amounts of vodka, cognac, Fusion brand versus (a non-alcoholic grape juice made from the same grapes as many wines), fruit essences and in some cases water-soaked oak chips. Participants were blindfolded using a cloth sleep mask. The researcher held a glass jar containing either wine or a non-wine underneath the participant’s nose and instructed the participant to inhale through their nostrils. During the first task, participants were asked to tell the researcher if they smelled a wine or a non-wine. During the second task, participants were asked to tell the researcher if they smelled a white or a red wine. Four white wines and four red wines were included. All jars during both tasks were chosen at random. Immediately following the olfaction tasks, participants were led to a computer and asked to rapidly categorise variably pixilated pictures of zebra patterns or fingerprints to allow the researchers to match this visual task with the olfactory tasks on difficulty of identification. Master Sommeliers were recruited with the assistance of JJ, Master Sommelier and extensively involved in both training of sommeliers and in the local community. After being approached informally by him and allowing their contact details to be shared, they were contacted by DB or SB to ascertain interest. All Master Sommeliers were considered eligible. The Court of Master Sommeliers provides a diploma to those who pass their four-stage examination process2. There are only 219 Master Sommeliers worldwide, all of whom have passed this process that takes several years. By including only individuals with this distinction, we could be assured that we were assessing true experts. However, this restriction did limit the number of sommeliers who we could include, and hence posed a limit to the potential sample size. Scores on the wine knowledge quiz ranged from 20 to 70% with a mean of 45%. Participants were able to distinguish between wines and non-wines with accuracy, ranging from 58 to 100%. Accuracy in distinguishing white wines from red wines varied from 25 to 91%. Accuracy at distinguishing between zebra patterns and fingerprints varied from 93 to 100%. Stimuli were selected based on participant accuracy. A new study has shown that drinking moderately three or four times a week may protect people against diabetes. In this Danish study, the association between alcohol drinking patterns and diabetes risk in men and women from the general ]population were examined (based on data from the Danish Health Examination Survey 2007–2008). The Danish scientists, led by Professor Janne Tolstrup from the University of Southern Denmark, publishing their findings in the journal Diabetologia. 76,484 survey participants (28,704 men and 41,847 women) were followed for a median of 4.9 years. Self-reported questionnaires were used to obtain information on alcohol drinking patterns, i.e. frequency of alcohol drinking, frequency of binge drinking, and consumption of wine, beer and spirits, from which drink-specific and overall average weekly alcohol intake was calculated. Information on incident cases of diabetes was obtained from the Danish National Diabetes Register. The investigation did not distinguish between the two forms of diabetes, Type 1 (where insulin needs to be injected daily) and the much more common but less serious Type 2. During follow-up, 859 men and 887 women developed diabetes. Compared to teetotallers, men who drink three to four days a week are 27 per cent less likely to develop the condition, and women 32 per cent less likely. The lowest risk of diabetes was observed at 14 drinks/week in men (HR 0.57 [95% CI 0.47, 0.70]) and at 9 drinks/week in women (HR 0.42 [95% CI 0.35, 0.51]), relative to no alcohol intake. Compared with current alcohol consumers consuming <1 day/week, consumption of alcohol on 3–4 days weekly was associated with significantly lower risk for diabetes in men (HR 0.73 [95% CI 0.59, 0.94]) and women (HR 0.68 [95% CI 0.53, 0.88]) after adjusting for confounders and average weekly alcohol amount. The study researchers concluded that "Our findings suggest that alcohol drinking frequency is associated with risk of diabetes and that consumption of alcohol over 3–4 days per week is associated with the lowest risk of diabetes, even after taking average weekly alcohol consumption into account." They also found that wine had the most substantial effect, probably because it contains chemical compounds that improve blood sugar balance. For both men and women, seven or more glasses of wine per week lowered the risk of diabetes by 25 per cent to 30 per cent compared with having less than one drink of wine. But gin and some other spirits had a negative effect on women, with just one drink a day increasing the risk of diabetes by 83 per cent. One to six beers per week reduced diabetes risk by 21 per cent in men but had no effect on women. Janne Tolstrup, of the University of Southern Denmark, said that she conducted the research because of previous studies showing an apparent connection between drinking and diabetes. She said she wanted to see if the pattern of drinking as well as the absolute quantities played a role. “I’ve done a lot of research into the association between alcohol drinking patterns and the risk of coronary heart disease,” "It is very evident that if you compare two men drinking the same amount, the risk depends on how they spread it out.” She wanted to see if the same applied to diabetes. The cause of the positive effect of alcohol and particularly wine is not clear, although some studies have suggested a link between alcohol and the length of time insulin remains in the blood when it is released by the pancreas in response to glucose/sugar. Insulin is used to regulate blood sugar levels and those deficient in it need to inject it and monitor their glucose levels. When he says “I’ve been asked whether I would recommend drink. Of course not,” but why not. The evidence is strong for a positive effect on health, particularly with wine. Don't be a slave to conventional prohibitioniest thinking! Some public health bodies including Public Health England’s have an official alcohol guidance which states that there is “no safe level” of drinking. However this new evidence gives further complelling evidence that as well as protecting people from heart diease and stroke, it can help prevent diabetes. Therefore most epidemiologists argue that there appears to be an overall health benefit from a small amount of drinking, even if some government bodies tend to reject this view. Given the French Paradox, where moderate drinking in the French has helped to overcome bad habit like excessive cholesterol consumption and smoking and this new study, it appears the naysayers are getting it wrong. Some cancers like breast cancer risk is elevated at a relative level, but overall moderate alcohol, with exercise and good food, plus avoiding smoking seems like the ticket to a long and happy life! Abstaining from alcohol is just no fun at all!